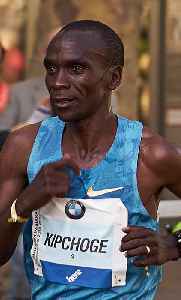 Eliud Kipchoge is a Kenyan long-distance runner who competes the marathon and formerly 5000 metres race. He won the Olympic marathon in 2016 and is the current marathon world record holder with a time of 2 hours 1 minute 39 seconds. Kipchoge's world record run at the 2018 Berlin Marathon broke the previous record by 1 minute, 18 seconds, the greatest improvement since 1967.